Doug Brush Percussion - BiographyDoug is an extraordinarily versatile percussionist. He received training in classical percussion at the American Conservatory of Music and Roosevelt University, graduating with honors. His teachers included Patsy Dash of the Chicago Symphony Orchestra and Ed Poremba of the Chicago Lyric Opera. In addition to a formal music education, he has studied with percussion masters in Cuba, Spain, North India, South India, North Africa, and West Africa among other locales. At the beginning of 2008, Doug spent four months in Ghana playing gigs and recording sessions, as well as doing television appearances with the top musicians of Accra. While in Ghana he also engineered and produced a High Life album for AFRIHI, an NGO dedicated to preserving traditional acoustic High Life music. This time in Africa was immediately followed by a tour of Bali, Australia and New Zealand where he was engaged to provide music for yoga workshops and retreats with the internationally known Dave Stringer and Allana Kaivalya. Highlights of 2009 include concerts in Vienna and Berlin with the University of Chicago based New Budapest Orpheum Society playing Jewish Cabaret music censored by the Nazis in the early 1900's and recently rediscovered; a rare performance of Ballet Mechanique by George Antheil at the Harris Theater in Chicago; and an appearance with the Chicago Sinfonietta, performing music that was recorded for permanent installation at the famous Oceanarium exhibit at the Shedd Aquarium. In March, he presented a lecture with Dr. Cristian Huepe, a physicist, on physics and music as part of the Chicago Cultural Center's Ars Scientia program. Since moving to Christchurch, New Zealand in early 2010, Doug has played and taught all over the country. He regularly performs with the Christchurch Symphony and most recently with the New Zealand Opera. He twice competed in the national brass band ﻿championships (‘outstanding percussion section’ comment), and founded and became musical director of Wontanara, a group dedicated to traditional West African drum and dance. In addition, he has started community classes in Arabic, African, Cuban, and Indian percussion. He teaches at Christchurch Polytechnic's Jazz School, Christ's College, Christchurch Boys High, and has many private students at the Christchurch School of Music and the North Canterbury Academy of Music. He has also taught workshops in many local schools, most recently for a Red Cross funded earthquake relief project at Rolleston school. He has hosted New Zealand workshops for international artists/teachers such as Mohamed Bangoura, Chris Berry, and Epizo Bangoura. In New Zealand he has also performed with Serj Tankian (System of a Down), Broadway star Andrea Burns, Kiwi legends the Topp Twins and Paul Ubana Jones, Fiona Pears, and the 'world jazz' group Mundi, among many others. He is a founder and the Artistic Director for the Little River Annual Drum festival, currently heading into it's fourth year. Along with Gert Killian, he was a featured performer in Pandimonium's 'AfricaAfrica' show in local schools. He performed in the Court Theatre's very successful run of 'The Mikado' in summer '13-'14. He has also been featured in North and South Magazine and has made local and national radio appearances. Across the Tasman, he teaches and performs as part of Dave Stringer's annual tour of Australia, now heading into it's sixth year. In 2013 Doug returned to the States where he had recording, performing and teaching engagements, including being house drummer for the MidWest Bhakti fest and a CD release party for Chicago based Gunnelpumpers. Doug has always been involved in a diverse range of projects from producing the critically acclaimed jazzy alt-country album Thorny Devil by Kristen Shout and Smoking Kitten, to performing in Chicago’s premier avant-garde chamber music groups, Fulcrum Point and CUBE, as well as playing traditional music from all over the world (Las Guitarras de Espana, Holy Goat Ensemble, Rhythmunity Ensemble, The Occidental Brothers Dance Band International). He is recorded on well over 50 albums. He has played for the delegates at the U.N. Headquarters in New York and at the Kennedy Center in Washington D.C. with The Chicago Classical Oriental Ensemble, an Arab classical orchestra. Doug also has extensive experience in theater having written music and performed in many of Chicago’s major theaters. He helped design the instruments for Steppenwolf Theater’s production of ‘A Clockwork Orange’ and designed and built instruments for Red Moon Theater’s ‘DrumTree’, both of which he also performed. He has played shows for ‘Broadway in Chicago’ including the hit musicals ‘Wicked’ and ‘The Color Purple’ and Tommy Tune's 'Dr. Dolittle'. He also played many productions with the renowned Chicago Shakespere Theater. Doug has also worked extensively in the dance community including work with South Indian dance (Siri Sonty), Irish dance (Trinity Irish Dancers) and Modern dance, including composing and recording the music for three Randy Duncan world premieres performed by members of The Joffrey Ballet and Hubbard Street Dance Chicago. Culminating a long relationship with the Art Institute of Chicago, in 2006-2007 Doug was an Artist in Residence there. In addition to participating in special events, he gave monthly lecture-demonstrations in the galleries as part of their Silk Road exhibit. In these engagements he spoke about instruments and musical cultures from across Asia. Doug has been internationally published dozens of times in articles he has written for the jazz and blues magazine, Downbeat.As the Sara Lee Chair of Percussion at the Merit School of Music from 2000 until 2009, Doug was involved in the training of talented teenagers from all over the Chicago area, many of whom who have gone on to successful musical careers. Also in Chicago, he taught extensively in inner-city outreach programs for the International Music Foundation and the Ravinia Festival. In these programs, he performed and lectured to over 100,000 Chicago public school students. His teaching experience runs the gamut from professional musicians to toddlers, terminally ill patients and retirees looking for a new hobby, to the homeless and socially troubled youth. Doug is an extraordinarily versatile percussionist. He received training in classical percussion at the American Conservatory of Music and Roosevelt University, graduating with honors. His teachers included Patsy Dash of the Chicago Symphony Orchestra and Ed Poremba of the Chicago Lyric Opera. In addition to a formal music education, he has studied with percussion masters in Cuba, Spain, North India, South India, North Africa, and West Africa among other locales. At the beginning of 2008, Doug spent four months in Ghana playing gigs and recording sessions, as well as doing television appearances with the top musicians of Accra. While in Ghana he also engineered and produced a High Life album for AFRIHI, an NGO dedicated to preserving traditional acoustic High Life music. This time in Africa was immediately followed by a tour of Bali, Australia and New Zealand where he was engaged to provide music for yoga workshops and retreats with the internationally known Dave Stringer and Allana Kaivalya. Highlights of 2009 include concerts in Vienna and Berlin with the University of Chicago based New Budapest Orpheum Society playing Jewish Cabaret music censored by the Nazis in the early 1900's and recently rediscovered; a rare performance of Ballet Mechanique by George Antheil at the Harris Theater in Chicago; and an appearance with the Chicago Sinfonietta, performing music that was recorded for permanent installation at the famous Oceanarium exhibit at the Shedd Aquarium. In March, he presented a lecture with Dr. Cristian Huepe, a physicist, on physics and music as part of the Chicago Cultural Center's Ars Scientia program. Since moving to Christchurch, New Zealand in early 2010, Doug has played and taught all over the country. He regularly performs with the Christchurch Symphony and most recently with the New Zealand Opera. He twice competed in the national brass band ﻿championships (‘outstanding percussion section’ comment), and founded and became musical director of Wontanara, a group dedicated to traditional West African drum and dance. In addition, he has started community classes in Arabic, African, Cuban, and Indian percussion. He teaches at Christchurch Polytechnic's Jazz School, Christ's College, Christchurch Boys High, and has many private students at the Christchurch School of Music and the North Canterbury Academy of Music. He has also taught workshops in many local schools, most recently for a Red Cross funded earthquake relief project at Rolleston school. He has hosted New Zealand workshops for international artists/teachers such as Mohamed Bangoura, Chris Berry, and Epizo Bangoura. In New Zealand he has also performed with Serj Tankian (System of a Down), Broadway star Andrea Burns, Kiwi legends the Topp Twins and Paul Ubana Jones, Fiona Pears, and the 'world jazz' group Mundi, among many others. He is a founder and the Artistic Director for the Little River Annual Drum festival, currently heading into it's fourth year. Along with Gert Killian, he was a featured performer in Pandimonium's 'AfricaAfrica' show in local schools. He performed in the Court Theatre's very successful run of 'The Mikado' in summer '13-'14. He has also been featured in North and South Magazine and has made local and national radio appearances. Across the Tasman, he teaches and performs as part of Dave Stringer's annual tour of Australia, now heading into it's sixth year. In 2013 Doug returned to the States where he had recording, performing and teaching engagements, including being house drummer for the MidWest Bhakti fest and a CD release party for Chicago based Gunnelpumpers. Doug has always been involved in a diverse range of projects from producing the critically acclaimed jazzy alt-country album Thorny Devil by Kristen Shout and Smoking Kitten, to performing in Chicago’s premier avant-garde chamber music groups, Fulcrum Point and CUBE, as well as playing traditional music from all over the world (Las Guitarras de Espana, Holy Goat Ensemble, Rhythmunity Ensemble, The Occidental Brothers Dance Band International). He is recorded on well over 50 albums. He has played for the delegates at the U.N. Headquarters in New York and at the Kennedy Center in Washington D.C. with The Chicago Classical Oriental Ensemble, an Arab classical orchestra. Doug also has extensive experience in theater having written music and performed in many of Chicago’s major theaters. He helped design the instruments for Steppenwolf Theater’s production of ‘A Clockwork Orange’ and designed and built instruments for Red Moon Theater’s ‘DrumTree’, both of which he also performed. He has played shows for ‘Broadway in Chicago’ including the hit musicals ‘Wicked’ and ‘The Color Purple’ and Tommy Tune's 'Dr. Dolittle'. He also played many productions with the renowned Chicago Shakespere Theater. Doug has also worked extensively in the dance community including work with South Indian dance (Siri Sonty), Irish dance (Trinity Irish Dancers) and Modern dance, including composing and recording the music for three Randy Duncan world premieres performed by members of The Joffrey Ballet and Hubbard Street Dance Chicago. Culminating a long relationship with the Art Institute of Chicago, in 2006-2007 Doug was an Artist in Residence there. In addition to participating in special events, he gave monthly lecture-demonstrations in the galleries as part of their Silk Road exhibit. In these engagements he spoke about instruments and musical cultures from across Asia. Doug has been internationally published dozens of times in articles he has written for the jazz and blues magazine, Downbeat. As the Sara Lee Chair of Percussion at the Merit School of Music from 2000 until 2009, Doug was involved in the training of talented teenagers from all over the Chicago area, many of whom who have gone on to successful musical careers. Also in Chicago, he taught extensively in inner-city outreach programs for the International Music Foundation and the Ravinia Festival. In these programs, he performed and lectured to over 100,000 Chicago public school students. His teaching experience runs the gamut from professional musicians to toddlers, terminally ill patients and retirees looking for a new hobby, to the homeless and socially troubled youth. 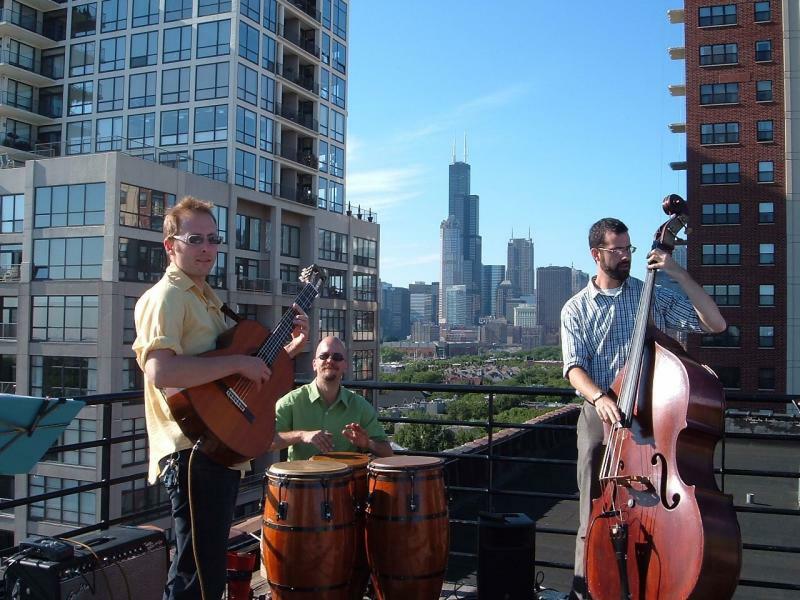 Occidental Brothers trio on a Chicago rooftop. Playing at the 'enstoolment' of the new chief of Sukum, Ghana. 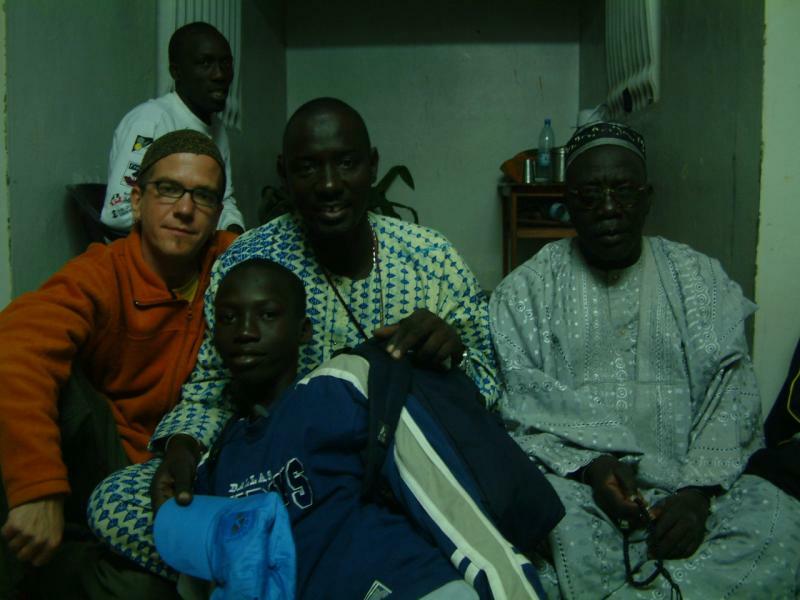 With Masamba Diop and family in Dakar, Senegal. The ever smiling Mustapha Tetty Addy. 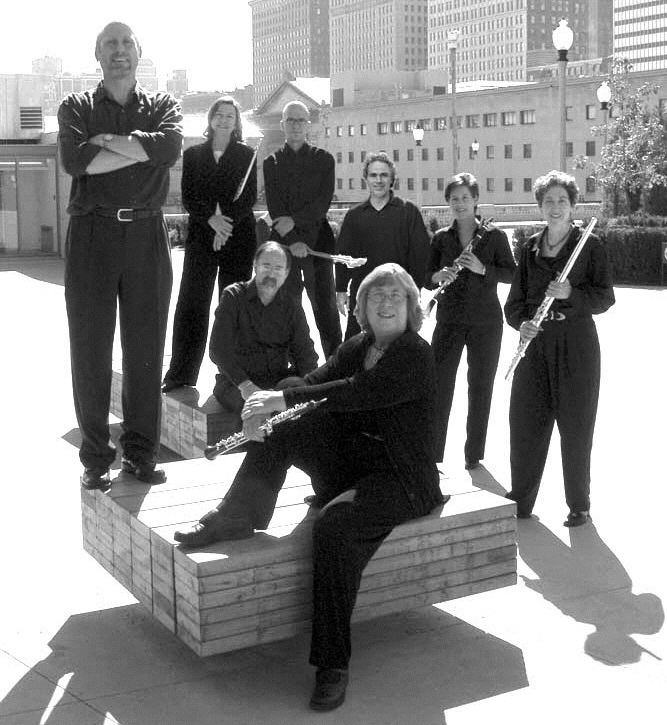 Cube, Chicago's premier contemporary music ensemble.